Tony Machi Fruits and Vegetables Inc. is a family run fresh produce distribution company. Our origins date back to 1914, maintaining the family name for freshness and satisfaction for over a century. 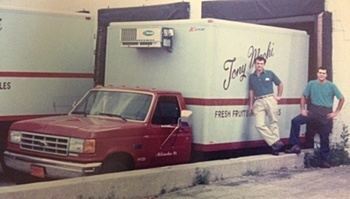 Beginning with no more than a horse-drawn produce cart and the desire for success in America, our grandfather and company namesake Tony Machi set out to provide a quality produce peddling service among the streets of downtown Milwaukee. Our father Leonard Machi continued this tradition of quality service, expanding the business to a wider customer base in the greater Southeastern Wisconsin area. Today, our business has evolved to include over fifteen delivery trucks and vehicles, and a 40,000 square foot warehouse facility on Port Washington Road in Glendale, WI. With the completion of our 15,000 square foot warehouse addition currently under construction, we will be able to provide continued and ongoing quality service. We have made every effort to adapt to market changes as well as to accommodate the ever-growing needs of the culinary industry, while never straying from the principles of quality service, attention to detail, and efficient deliveries that were set forth by our father and grandfather. We thank you for your continued patronage and trust in our service, and we hope to hear from you soon concerning your produce, dairy, and cheese needs!